Earlier this year, a multi-purpose training hall and exhibition center — The Okinawan Karate Kaikan — opened in Tomigusuku City, Okinawa. A multi-purpose venue, it's a training facility for karateka that includes a museum, classrooms for teaching seminars, a general dojo and a "Special Dojo" featuring red tiled ceilings and traditional adornments used exclusively for testing high ranking black belt candidates. The creation of The Okinawan Karate Kaikan coincides nicely with even bigger news: For the first time, Karate will be an event for the Summer Games in the 2020 Olympics to be held in Tokyo. 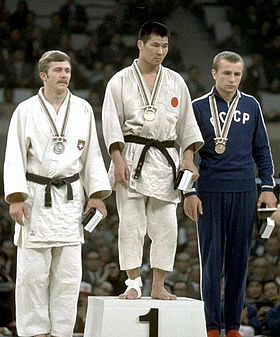 * This is both timely and appropriate, as the art of Judo made its Olympic debut in the same city in 1964. In advance of the upcoming Olympics to be held on the mainland, Okinawan businesses are anticipating an economic ripple event from the expected rise in tourism. There are a number of attractions on the island to attract martial arts enthusiasts from abroad, including some 400 karate schools. For nightlife, there's even a Dojo Bar in Naha City that features old style karate memorabilia and decor. As an enticement to come to the island, The Dojo Bar, in collaboration with KARATEbyJesse, is running a Okinawan Karate Nerd Programme that's a "once-in-a-lifetime opportunity for two young Karate Nerds between the ages of 18-35 to fly to Okinawa and live there for 6-12 months and experience the Way of Karate at its source." As for the 2020 Olympics in Tokyo, there's no doubt there are purists who will deride the idea of karate in the Games. Indeed, when Gichin Funakoshi introduced Okinawan karate to the Japanese mainland in 1922, he was diametrically opposed to the idea of karate tournaments; in his view, competition was antithetical to the true spirit of karate. Compare this notion to that of the founder of Judo, Jigaro Kano, who set out to promote his martial art specifically with the Olympics in mind. In Kano's vision, the Olympics would be the perfect vehicle to spread judo to the world. For him, judo-the-sport and judo-the-martial way were both compatible and complimentary to each other. 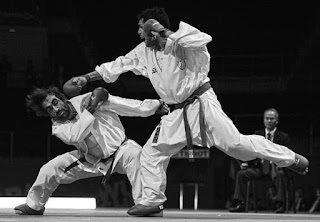 So far Olympic Karate will feature two events for individual competition: Kumite (fighting) and Kata (forms). Scoring will be based on World Karate Federation (WKF) rules. Therefore, for senior men and women (over 21) there will be five weight classes each. Kata will be the empty-handed variety, no weapons. Although this is sport, the WKF is still intent to preserve the tradition in karate. Nothing gaudy like camouflage belts; the gi (uniform) must be white. Vital area shots are prohibited, as are low kicks and strikes delivered with excessive contact. So much for tradition.† Strikes to the head, face, and neck are allowed but must be delivered like a "touch" (or as one instructor I had wryly put it, 'touch one side of the face to the other'). Hand guards, mouth-pieces, shin and foot protectors are mandatory, but curiously, groin protectors are optional. Through the years sport karate has had to endure its share of problems and politics. I'm not certain karate can avoid the scandals and controversies that have been pervasive in Olympic competition for so long. Perhaps Funakoshi was right. * This was actually announced last year. † That's a joke. Heavy sparring usually provides a good metrics for handling pressure, among other things. An astute ref can determine when "excessive contact" can be regarded as what Mike Tyson used to call "bad intentions." Not very sportive.